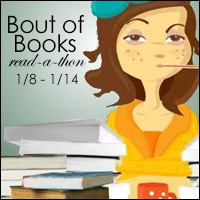 Bout of Books starts on Monday, January 8th and goes through Sunday, January 14th. My goal, as it always is, for the Bout of Books 21 TBR pile is to read 250 pages per day, which amounts to 1,750 pages for the whole week. Doing another round of Bout of Books, we shall see how it goes. I love participating because there are really no rules, you are just challenge yourself to read more than you typically do. So I am hoping for a great week in books! I always love doing the one in January in hopes that it will kick off a good year of reading! This is a total of 1953 pages!